This medium blend delights with a rich vanilla flavor. Rich, creamy vanilla flavor. 24-count box. At Gloria Jean’s®, coffee is our passion. We painstakingly select our Arabica beans from only the most discriminating sources, with whom we share a commitment to bring you the highest quality coffee in the world. 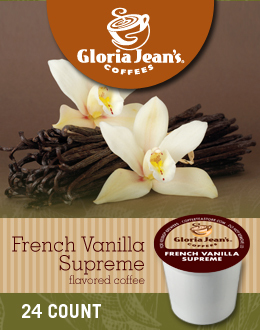 From bean to cup, nothing is compromised, making Gloria JeanÕs coffee the very finest you can buy.